This article is on behalf of the South Central Development Corporation. This is an ongoing series of community members’ stories introducing us to the people and the possibilities that reside in the Winner area. If you have a suggestion of someone that you think should be featured, contact Karla Brozik at 842-1551. The journey of life has led Jake & Dr. Laura Handcock many directions in life. They have come together to make their home in Winner. Dr. Laura went to high school in Geraldton, Western Australia, which is in a county of about 35,000 people. She then went to Murdoch University in Perth, Western Australia and she graduated with a Bachelor of Science and Bachelor of Veterinary Medicine and Surgery. Dr. Laura then worked part-time for a small animal clinic and a beef cattle clinic, so she could experience both aspects. After 3-1/2 years at the beef practice in Australia, Dr. Laura accepted an internship at Virginia Tech in Blacksburg, VA. The main reason she accepted the internship was to obtain her Visa. She was an instructor at Virginia Tech where students in their last year of veterinary school would ride along with her for veterinary experience and instruction. After this job, she realized she didn’t like being an instructor and didn’t like living in the mountains! In the Blacksburg, VA area, the average rancher had 33 head of cattle and she was doing veterinary work that most ranchers do themselves around here. Before starting her new job in Winner, Dr. Laura received a letter in the mail informing her she had to return to her home country of Australia and re-apply for her Visa transfer. Her Visa transfer took about 6 weeks and then she was able to begin working at the Animal Clinic in Winner. Dr. Laura currently has a green card, but hopes to someday obtain dual citizenship. Jake Handcock went to high school in Kadoka, SD. He grew up on a farm near Long Valley, SD. Jake studied at South Dakota School of Mines for a few years before deciding to join the military. Jake joined the Marines in 2004. He started as an ammunition technician for 2 years in Japan. He then worked in explosive ordinance disposal for 7 years with being stationed in Japan for 2 of those years and also deployed to Afghanistan for 2 tours. Jake and Dr. Laura met on an online dating website. They joke about meeting on farmersonly.com, but unfortunately it was not that website! They started talking online and dating in late 2014. Jake thought Laura’s online profile was fake – an Australian veterinarian living in Winner, SD! Apparently, he found it was a true romance! Jake gave up pursuing jobs in Maryland and Texas to live in Winner with Dr. Laura. Both Jake & Dr. Laura say when they do visit a big city, it is more fun because it is a treat. Jake states, “Winner is a cost-effective place to live. Neither one of us have to drive a whole lot. Housing is cost-effective and utilities aren’t bad. 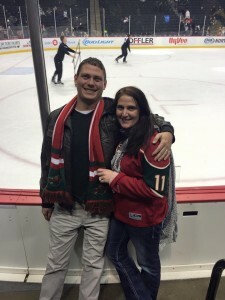 So when you do go someplace big, it is really nice that you’ve got the opportunity to save up money if you take the time and effort to plan ahead.” The couple enjoys their annual trip to Minneapolis to watch a hockey game and enjoy the big city life. Pheasant hunting season blows Jake’s mind. “I can’t believe how this town comes to life.” Dr. Laura’s states pheasant hunting in Winner is “a good little population explosion”. She states, “It’s great for the town’s atmosphere, economy, and a good thing to look forward to every year. On the large, we get good people that come here.” Jake states a lot of their regular customers during pheasant hunting season used to go into Gene Hansen’s store and just continue to come in even though it’s Gary’s Gun Shop now. Dr. Laura states they try to be involved in the community. She helps out with 4H and tries to attend most FFA events. Jake is becoming more involved with the Gun Club. Dr. Laura expresses, “Go to all these little activities that are out there. They aren’t going to be there forever if you don’t support them. That’s how people then recognize you.” Dr. Laura says most people know her, but didn’t know the vet’s husband. Jake jokes, “I have been called Mr. Laura on more than one occasion!” They both want to be involved in the Winner community and meet new people. Stop by Gary’s Gun Shop and meet Jake Handcock and if you are lucky, you can catch Dr. Laura Handcock at the Animal Clinic.